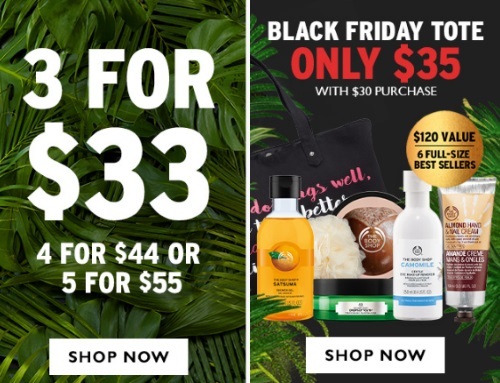 The Body Shop's Black Friday Deal is a good one! Get 3 items for $33, or 4 for $44 or 5 for $55. Mix and match most items to choose which ones you want for this deal (offer excludes gift sets). Also, get their Black Friday Tote for only $35 with any $30 purchase. The tote comes with 6 full-sized items and is a $120 value.